Interested in meeting the Tolkien Professor in person? See where he’s going to be appearing in the upcoming weeks and months! (You can also see where he’s been, but that won’t help you meet him, unless you are a time traveler.) Click on the links to get the details about each upcoming event. 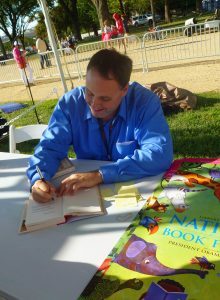 Dr. Corey Olsen signing books at the National Book Festival in Washington D.C.
Acorn Books – Smyrna Delaware, September 18, 2012.